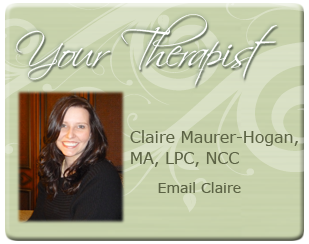 Claire Maurer-Hogan is a graduate of Central Michigan University and is the owner of The Wellness Collective. Her desire is to establish a place where clients can receive comprehensive self care in the midst of their busy lives. She enjoys working with adults, adolescents and couples, and her areas of interest include grief and loss, relationship issues, depression/anxiety, sexuality counseling, and women’s health. Claire is a member of the American Counseling Association, Counselors for Social Justice, The Michigan Association of Counseling and is currently pursuing certification from the American Association of Sexuality Educators, Counselors, and Therapists. Counseling is an intricate journey powered by the relationship established between the client and the counselor. This relationship is one based on trust and unconditional acceptance as we unfold and navigate different paths to bring restoration and balance to your life. Trusting that you are the expert of yourself, we will be a supportive sounding board that will encourage, challenge and positively confront you to reach your goals. There are both exciting and painful risks that may present themselves in as you engage in the counseling process, ones that will ultimately bring fulfillment. While our general philosophy derives from a client centered approach, various other clinical approaches are used often when appropriate. We look forward to partnering with you; please feel free to ask if you have any questions.